From the City of Brotherly Love comes the Philadelphia Phillies, one of the National League East division's teams with the most passionate fan base in the MLB. Are you a Phillies superfan? Nothing shows your love for your hometown team and your family like our Personalized Family Cheer Philadelphia Phillies custom wall art. 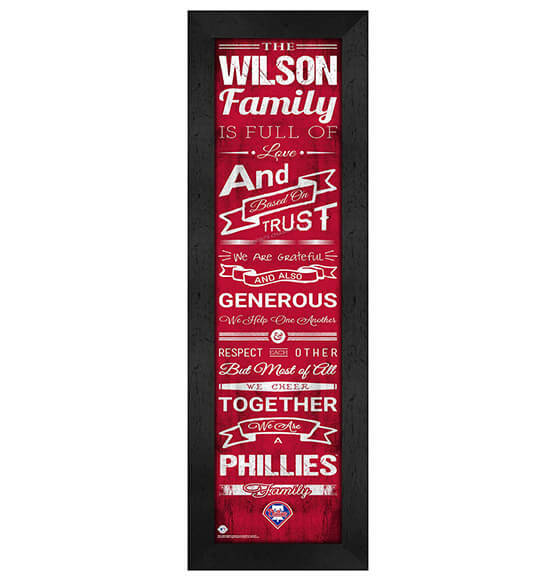 Featuring brilliantly vibrant Phillies team colors and logo designs, this vertical-hanging MDF vinyl-wrapped, glass-protected print speaks to the heart with touching sayings. Best yet, this vintage-style print hangs quickly and easily thanks to the included sawtooth hanger.